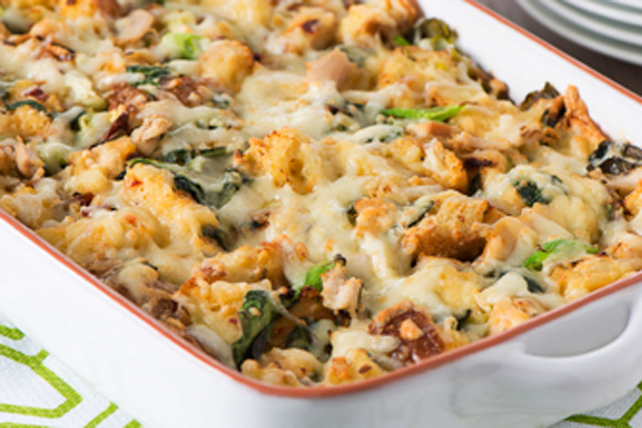 This savoury baked pudding is the perfect entrée to enjoy on a chilly evening. Whisk eggs, milk and dressing in large bowl until blended. Add bread and 1 cup cheese; mix well. Heat oil in large nonstick skillet on medium heat. Add leeks and pepper; stir. Cook 5 to 7 min. or until leeks are softened, stirring frequently and adding garlic for the last minute. Add spinach; cook and stir 1 to 2 min. or just until wilted. Add chicken and tomatoes; mix well. Remove from heat. Add bread mixture; mix well. Spoon into 13x9-inch baking dish sprayed with cooking spray; cover. Bake 30 min. or until centre is almost set. Top with remaining cheese; bake, uncovered, 15 min. or until centre of pudding is set and cheese is melted. Prepare using your favourite variety of Renée's Caesar Dressing.